In Ireland St Patrick's day is a public holiday. No School, no work, bliss! Living outside of Ireland you miss out on this benefit. With all the political correctness in this day and age where all religions are recognised and employers have to be very careful not to discriminate against anyone I put a lot of thought into demanding an extra days leave from my job at Toronto Private. I didn't get very far but was told I could wear my Irish rugby top to work instead. 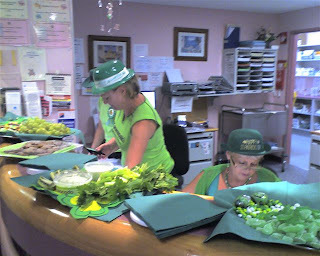 Imagine my surprise when I arrived at work at 7am to find EVERYONE wearing green! 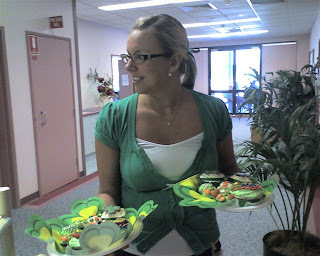 Platters of green food were layed out with green snakes, green M+M's, celery sticks and pesto dip and even an amazing platter of cupcakes with rainbows and gold coins that were made by one of the Speech Therapists! 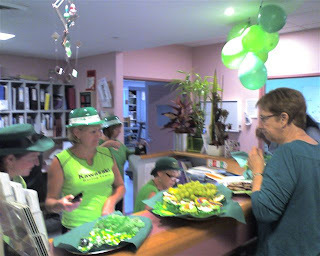 It was a fun day with lots of "Top o' the mornin' to ya" and the best nibbles at morning tea time. Not quite a day off but not a bad days work either! How to make Shamrock cookies. Jelly Beans and Martini glasses!